If you’re as passionate about testing new eye shadow palettes and finding the perfect mascara as us, you’ll know that great eye makeup can transform an entire look. Here are the eye makeup trends our makeup artists just cannot wait to have fun with in 2019. We couldn’t take our eyes off our new makeup muse Lucy Boynton when she debuted her retro-inspired eye liner at the 2019 SAG Awards. As the Queen of cool-girl beauty, you can bet that makeup lovers everywhere will be taking inspiration from Lucy’s bold but refined liner style, created by celebrity makeup artist Jo Baker. If you’d like to try this makeup look for yourself (without going full Red Carpet), use a liquid liner to draw a winged eye liner shape on your eyelid without colouring it in – just the outline. We’d love to know what you think! Our Head of Makeup, Jo Twidale collaborated on this look during an editorial shoot for Laud Magazine, and we can’t wait to see what other interesting eye shadow shapes she comes up with throughout the year. In 2017 and 2018, it was all about perfecting the subtle smoky eye, but in 2019, we’d love to see people shaking things up. Any opportunity to add your own creative flair is one worth taking in our books. Hot pink mascara featured in the Ulla Johnson Spring 2019 fashion show earlier this year – a creation of the very talented makeup artist Romy Soleimani. We absolutely love the pop of drama it gives to a mostly natural makeup look. The mascara pictured is YSL’s Mascara Vinyl Couture in the shade I’m The Madness. This powerful mascara also comes in emerald, sapphire and golden tones, which would look stunning when paired with a glowing complexion and natural lip colour. Jo worked on this look during the latest Melbourne Fashion Festival, and judging by the photos, we have a feeling this look will be doing the rounds in 2019. 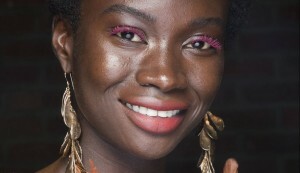 Recreate this look yourself by adding blush to the C-shaped area around your eyes (where you’d usually put highlighter). While this look might be a touch too bold to incorporate into your everyday routine, keep this one earmarked for racing season and other special events this year. Want to Try One of These Eye Makeup Trends with Our Professionals? Whether you want to try one of these bold eye makeup trends for yourself, or you’d prefer a more classic and natural makeup look, our makeup artists are passionate about making you feel your best. Get in touch to secure your makeup appointment.